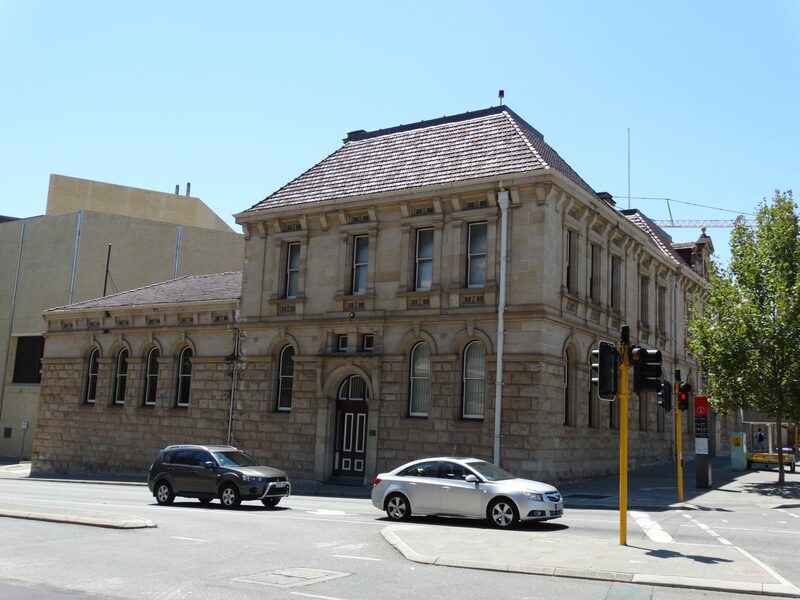 The Perth Courts of Petty Sessions – also referred to as just the Police Courts – was opened for business at 10 am on Monday 17 July 1905. Although not fully completed, it appears that those that worked for the Courts couldn’t get into their new building soon enough. When it was opened the new building was considered an ornament to the city’s architecture, unlike the old Court building which was described as the malodorous old barn and ‘…the stinking shambles in Barrack street of which everybody connected therewith will be delighted to take an eternal farewell’. The first case heard, by Police Magistrate Augustus Sandford Roe, was that of James Walker who was convicted of drunkenness, but the charge was duly dismissed in honour of the occasion of the opening of the new Police Courts. The location of the Police Courts in this area did also not go unnoticed at the time it was opened, in that it was seen as conveniently located near to Perth’s brothels, also located on Roe Street, and the police presence was therefore ideally situated to be able to keep a casual eye on those operations. 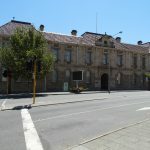 The Courts of Petty Sessions and the Police Barracks were built at a time when the Police force in Western Australia was expanding owing to the 1890s Gold Boom. The need for proper and better equipped Police and Courts buildings, and the financial capacity to build them, was directly related to boom; to cope with the rapid population growth and the many issues that the new-found and increasing wealth was generating. The Police Act 1892 also influenced the construction of the new Courts of Petty Sessions, setting out the full list of offences that were handled by the Petty Sessions, which included obscenity, disorderly conduct, negligent driving, vagrancy, gambling, injuring public property and certain assaults or acts of stealing. The new Supreme Court in Stirling Gardens was also built at much the same time, completed in 1903. In 1975, the new Police headquarters near the causeway in East Perth were completed and many of the police operations moved to there. The Police Courts remained in this building until 1982, after which it was made available to the Art Gallery for additional exhibition space. Conservation and adaptation work was carried out in stages and two enclosed links constructed to the rear to link to the main Art Gallery Building, and with the Police Court room left mostly as it was. The work was completed in 1995 and it was opened as the Centenary Gallery. 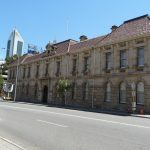 The Courts of Petty Sessions was part of what was a significant justice precinct located in the Northbridge area that also comprised the old 1855 Police Courts and Gaol/Lockup (which became part of the WA Museum) and the 1903 Police Barracks (now the AGWA Administration Offices), and there was also the former Swan Barracks (which housed the military) located just to the north on Francis Street. From 1830, criminal matters in Western Australia were determined either at the Courts of Petty Sessions, which oversaw minor offences, or the Courts of Quarter Sessions, which dealt with more serious crimes and which was effectively later assumed by the Supreme Court as well as later the District Court which was created to deal with intermediate level crimes. When it was established, the Courts of Petty Sessions heard cases of adults (18 years or older) charged with a criminal offence which did not require a jury and were presided over by a Magistrate or Justice of the Peace – such as matters relating to convicts, liquor licences and child maintenance. The Police force in Western Australia was established in 1851. In the early days law and order was enforced by civilians who were recruited as honorary constables and supervised by a government-appointed sheriff and chief constable. Later individuals were more formally appointed as paid constables on a needs basis. 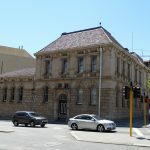 Perth’s first purpose-built courthouse (which is now the Old Court House Law Museum) was constructed in 1836 in Stirling Gardens at the foot of Barracks Street. In 1855 a new Court House and Gaol was built on James Street – where the Museum is located. 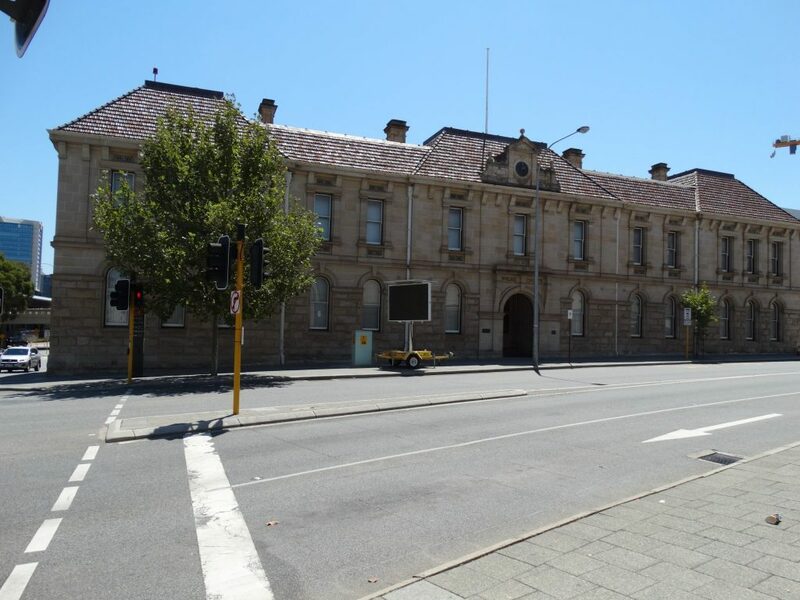 However, only the first stage of the gaol and courthouse was ever completed, and as accommodation in the gaol reached capacity the court room functions were transferred back to the original court building in 1863. In 1888 the gaol in James Street was completely closed and used as government offices as well as housing the beginnings of the WA Museum. The Gold Boom also brought with it something else to Western Australia – talented architects and skilled labour. The Courts of Petty Sessions is a fine example of a Federation Second Empire (French Renaissance) style highlighted by the use of Donnybrook sandstone to the lower section – a fabric that was used in many of the late 19th and early 20th century buildings in the precinct – and tooled ashlar above. It is an excellent example of that era, not only reflecting the talent and skills of the architects working in WA at this time such as Chief Government architect, Hillson Beasley, but also the high standard of workmanship of the many fine builders and artisans who had also come to WA with the lure of the gold and the massive building activity that generated, such as S. B. Alexander who built this building. The presence of this classically planned, two storey building is enhanced by its prominent corner location and its dominant mansard style roof originally clad in green Vermont slate roof – the same as the old Police Barracks. 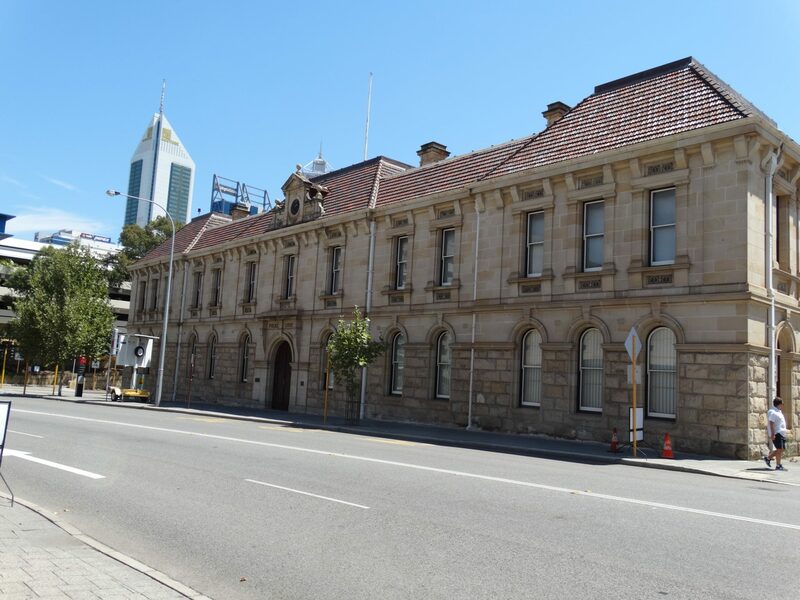 Its original frontage addresses Beaufort Street with the main entry to the building located underneath the clock pediment, although the Police Court had its entry off Roe Street. Inside the building featured large rooms, lofty ceilings and fine timberwork. The courtrooms – being the Police court, Local court, Coroners Court – and supporting accommodation for the magistrates, justices, coroners, solicitors, bailiffs and clerks were located on the ground floor, and office and administrative accommodation for the Commissioner of Police and his staff and records were on the first floor. With the introduction of motorised vehicles in the early 20th century, the 1919 Traffic Act was introduced and driving offences then came under the jurisdiction of the Police Court; offences which by the 1930s – with the surge in car ownership – was to dominate the Court’s business.